Alcohol addiction starts gradually and turns into a serious problem over time. Since the symptoms occur gradually, many individuals do not realise that they are developing a problem. Understanding the various stages of alcohol addiction and their symptoms can help you recognise what is going on with you or your loved ones. Alcohol use disorder is a progressive disease. Addiction is considered a disease because people do not choose to become addicted, just as a person with cancer does not choose to have the condition. Both diseases require professional treatment and both come in stages. In the initial stage of alcohol addiction, high-functional alcoholics generally have no control over the amount that they drink following their first drink. They drink to become drunk. While this may sound meaningless, it is important to realise that the normal drinker does not drink alcohol to become intoxicated. They do not like experiencing memory loss or losing control so they actually drink less than you may believe. Alcoholics, on the other hand, aim to lose control and enjoy the feeling of oblivion. Stage one alcoholics usually do not drink on a daily basis. They tend to consume alcohol a few days per week or on the weekends, but it seems to be less frequent than you would expect. During this stage, drinking is still a desire instead of a need. Nevertheless, they drink excessive amounts when they do drink. They may become injured or embarrass themselves due to their level of intoxication. The worst part is that they will binge drink, or drink more and more, as their tolerance increases. Stage two alcoholics drink to feel better. They turn to alcohol whenever something happens in their lives, whether it is good, bad or anything in-between. They become incapable of dealing with the ups and downs of life without drinking. In this stage, they start to have compulsive thoughts, and their desire turns into a real need. Individuals in stage two will find any reason to drink. This phase is usually when those close to them start to realise that there is a problem or the alcoholic will notice that, even though they are able to perform their regular duties, they are starting to drink heavily or prioritise drinking. Interventions or discussions regarding their habits do not occur at this stage, though their loved ones often start noticing that something is not right. An alcoholics whole life begins to change during the third stage of alcohol addiction. Their priorities become completely rearranged since drinking requires immense attention and they will have to start dealing with issues that occur due to their drinking habits. Alcoholics in this stage tend to be questioned and accused by their family members and friends, who start to inquire about their life, mental state and the people they are hanging out with. The alcoholics mental state often starts to deteriorate due to the stress of dealing with these problems, which can lead to legal issues, isolation, and depression. As a person’s drinking increases so do their chances of running into legal problems, such as DUIs or damaged property. Alcoholics start to isolate themselves in an attempt to avoid people who remind them that they have a problem or who ask questions that make them feel uncomfortable. The reality of being an alcoholic combined with feelings of guilt, stress, shame and financial worry is a formula for depression, and alcohol’s natural depressant properties only make matters worse. By this stage of alcohol addiction, the alcoholics body is noticeably not what it used to be. Many alcoholics constantly feel irritated, tired or foggy. Liver damage and high blood pressure start to come into the picture, along with several other conditions such as stomach distention. Alcoholics in this stage may wake up with the shakes and there may be a flush to their skin. Drinking on a daily basis is unhealthy and it becomes evident at this point. It is common for many alcoholics in this stage to be prescribed a multitude of pills to manage symptoms like stomach ulcers and heartburn. Even though the medications may provide some relief, the conditions cannot improve if the person continues to drink. The last stage of alcohol addiction for functional alcoholics is when most stand by the fact that they continue to go to work. While many of them may still be buzzed from the previous night, they will still emphasise the fact that they showed up. Even though they are physically at work, their performance often diminishes. However, some high-functioning alcoholics are able to hide this at work for years. Though in time the side effects of alcohol addiction will become increasingly harder to manage. While individuals experiencing stage four may still be functioning, their addiction is gradually becoming less manageable and the signs are beginning to show that the problem has to be addressed or it will become life-threatening. Seeking treatment may not be an easy choice, but it is certainly the best thing that you can do. 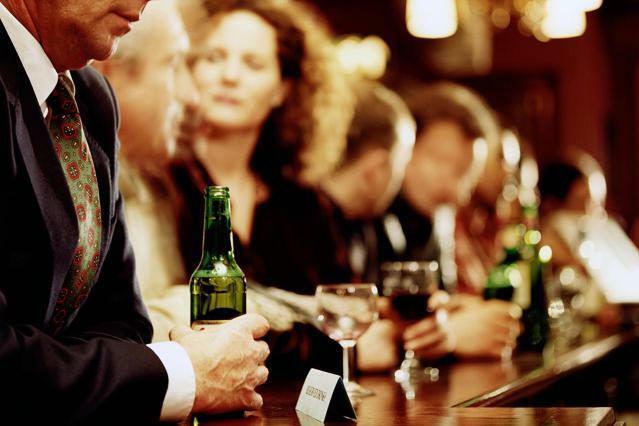 If you or someone you know is battling an alcohol addiction, now is time to get help. The Dawn Medical Rehab & Wellness Centre is an inpatient drug and alcohol rehabilitation centre where our clients are taken care of by a licensed team of addiction professionals, using personalised treatment plans and evidence-based techniques to increase your chances of success.